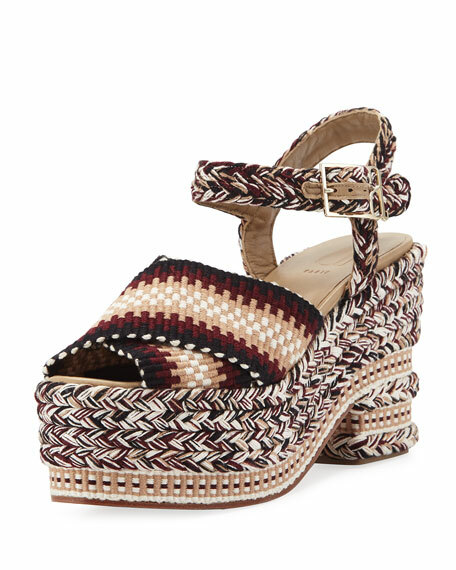 Aquazzura "Fez" espadrille in embroidered canvas. Antolina "Brenda" espadrille sandals. 4" braided-jute heel with platform. Crisscross upper in woven cotton. Adjustable ankle strap. Peep toe. Calf leather sole. Lamb leather insole/lining. Padded footbed. Made in Italy. 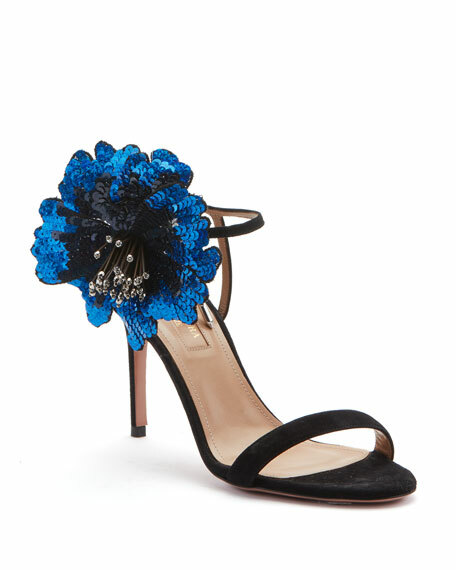 Aquazzura suede sandal with sequined and beaded flower motif. 3.3" covered stiletto heel. Strap bands open toe. Self-tie ankle wrap. Leather lining and sole. Made in Italy. Aquazzura metallic two-tone leather mule. 2" covered stiletto heel. Strap bands open toe. Layered strappy vamp. Slide style. Leather lining and sole. "Rendez Vou" is made in Italy. Aquazzura metallic leather and transparent PVC sandals with jeweled studs. 4.3" covered stiletto heel. Open toe. T-strap vamp. Adjustable ankle strap. Leather lining and sole. "Shine" is imported.